South Yorkshire Police has commissioned an independent investigation into its handling of the Rotherham child abuse scandal. The inquiry will "examine the role of both the police and council... and address any wrongdoings or failings," Chief Constable David Crompton said. A report last week said more than 1,400 children were abused from 1997 to 2013. Revelations of child abuse on a massive scale in the Jay Report prompted calls for resignation among those in power at the time. Mr Crompton said it made for "painful reading" and laid bare the failings of the force over a number of years. On Tuesday, he said: "The investigation will properly and independently examine the role of both the police and council during the period identified and address any wrongdoings or failings, which will allow the appropriate action to be taken. "We must give victims the confidence to come forward in the knowledge that all agencies will listen, will act, provide appropriate support, and relentlessly pursue those who offend against our young people." The inquiry will be led by another police force. Yvette Cooper MP, Labour's shadow home secretary, had called for South Yorkshire Police to refer themselves to the Independent Police Complaints Commission over failings in Rotherham. Meanwhile, the Labour Party has announced it has suspended four members, including Rotherham councillors and former councillors, in the wake of the scathing report into child sexual abuse in the town. The party suspended councillors Gwendoline Russell and Shaukat Ali, as well as the council's former leader Roger Stone and ex-deputy leader Jahangir Akhtar, pending an investigation. Labour's ruling National Executive Committee (NEC) has taken control of a new "rigorous" procedure for selection of candidates to the local council in the South Yorkshire town. And the NEC's approval will be required for any application to rejoin the party by Shaun Wright, who quit Labour following the publication of the Jay Report, but has refused to step down as police and crime commissioner for South Yorkshire, as well as former councillor Maurice Kirk. The four who were suspended held positions of responsibility in Rotherham during the years when children were abused. Labour said it had instructed the party group on Rotherham Borough Council to set up a scrutiny committee on child protection, including independent advisers, to help rebuild public confidence in the council. It added: "Further action against others in positions of responsibility at the time may follow. Those responsible must be, and will be, held to account." Labour MP and shadow education secretary Tristram Hunt told BBC Radio Sheffield: "This is not just taking place in Rotherham, it is taking place across cities and communities, in children's centres, in home environments across the country. "If people aren't stepping up to the plate and accepting responsibility then we've had to intervene as a party at a national level to say this is not the kind of leadership we expect from elected officials." The Jay Report was critical of the failure of responsible authorities to respond to warnings that children - many of them teenage girls in local authority care - were being preyed upon by gangs of older men. 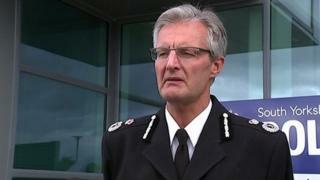 Rotherham abuse scandal: Who was in charge?